Prepare to answer the “Time to Think” comprehension and discussion questions for selections within the 6th grade readers. 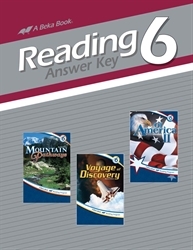 This consolidated resource includes the questions and answers for Mountain Pathways, Voyage of Discovery, and Of America II. Be prepared to answer your child’s questions with your own handy Answer Key.